Star Wars: The Last Jedi's 14 deleted scenes tease... wait, MORE casino planet and a new opening? Star Wars: The Last Jedi may not have been everyone’s cup of blue space milk, but, wait, there’s plenty more where that came from. 14 more deleted scenes, to be precise. That’s right, some of the clips Rian Johnson and the editing team left on the cutting room floor are going to see the light of day with the home release (13th March in the US and 9th April in the UK), and we now know what they’re called. The deleted scene titles come from StarWarsNewsNet, but also via Australian retailer JB Hi-Fi and Amazon France. Of course, unless you’re fluent in French (what the hell is a Finn et Phasma, anyway?) you’re gonna want to read the English version. Join me as I (probably wrongly) speculate about what might go down in the deleted scenes. Pretty simple this one. A different version to the one we saw in cinemas. In fact, you can see the tiniest glimpse of it on this Rian Johnson-shared video of John Williams doing his thing. You can just about make out a spaceship floating in space. In the original opening, Poe takes out several First Order fighters before getting a direct line to General Hux. It was more light-hearted than many might have expected. The ominous outline of a looming ship in the alternate opening might see it go in a completely different direction. No, not Rose’s sister rocking out to some Tico-approved tunes, sadly. This sounds like a longer look at Paige’s final stand – and one where her vessel can’t go pew-pew-pew. Err. Who knows? 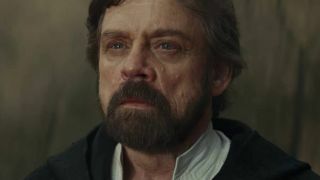 I’d like to think it’s just after Luke hears about Han’s death. Sure, he looked fairly shaken-up in the movie proper, but he didn’t get a chance to properly react. Trust Poe to make a wisecrack. This could come from anywhere in the movie – he was originally planned to join Finn on his trip to Canto Bight – but I reckon it’s going to be part of the escape on Crait. No, not Finn trying to make it viral. I’m guessing BB-8 was filming something he shouldn’t have been…. One of the more under-appreciated aspects of The Last Jedi was the comedy. Rey constantly (accidentally) annoying The Caretakers on Ahch-To during the movie was a great running joke – and we might be seeing more of it. Ok, we’ve probably already seen this one. Rey lectures Luke after sending her through some training. The Caretakers are in the background having a nice little party, bless ‘em. Pretty self-explanatory. Fathiers are those weird space-horse thingies on Canto Bight and we’ll be seeing more of them, Finn and Rose outrunning the law. This sure sounds like something to do with Finn, Rose, and DJ’s mission onto Snoke’s The Supremacy. The actual sequence in the movie definitely felt a little clipped, so it’s nice that we’ll get a little more of the spy/espionage stuff that Star Wars does so well. Probably another one on-board The Supremacy. The Stormtroopers had a bit more of a personality this time around – isn’t it about time that Rose got her own back on a few of them for, y’know, trying to execute her (and killing her sister)? Uhh. What? Ok, ok, it’s going to more than likely be a Finn boast after besting Captain Phasma but, still, what? I’d be surprised if this isn’t another Canto Bight sequence. It’s probably the most mysterious-sounding of these deleted scenes, though. Neither of these characters really ‘belong’ in the action-packed Resistance filled with heroes… so where could they be headed? This will connect the dots between Rey just showing up on Crait and actually deciding to go and save the day. Bonus points if we get Chewie grumpily batting away Rey’s hand for pressing the wrong button. Look, if you weren’t into Canto Bight, what can I say? It was pretty fun, if completely out-of-sync with the rest of the movie. This bit (which sounds more like a feature and less like a deleted scene, I must say) may actually help you buy into the casino planet a little more. Thank Yoda these weren’t deleted: The 20 greatest Jedi moments in Star Wars history.